After looking more into the threadless loves contest, I decided to do something more professional and simple, that shows the positive side of what a geek is all about the knowledge and how the answers to many unasnwered questions is out there in someones mind waiting to be discovered. 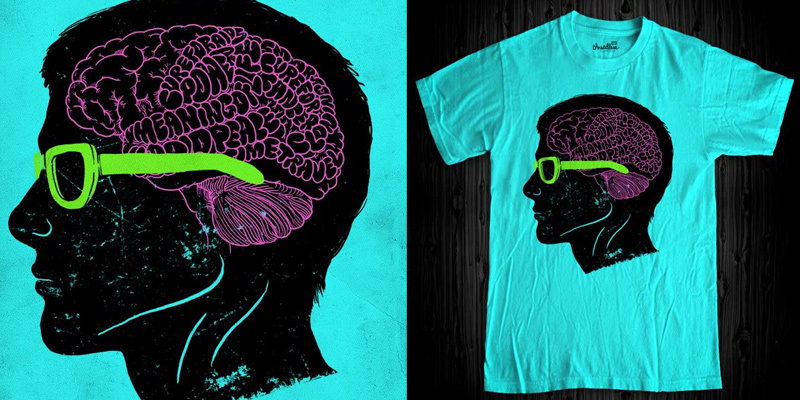 this would be a 3 color print on either a mint of turquoise color shirt. pretty funky colors! so cool! I love this. I would definitely pick this shirt up. Attila said: Yeah this is a different style, i like it! well done man. enjoying the texture on the head. Loving this different style! Eloquent. Will the grunge/distress be halftoned, i've been curious about that for a while. not its just flat color, and whatever is distress is just part of the shirt color. love this love this love this love this love this! oh man, this would be an amazing TPM shirt. godsloadedsociety said: oh man, this would be an amazing TPM shirt. excuse my ignorance, what is TPM? jimmyh said: love this love this love this love this love this!